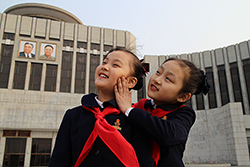 After years of negotiation the Russian director Vitaly Mansky was invited by the North Korean government to make a film about one girl and her family in the year she prepares to join the Children's Union, on the 'Day of the Shining Star' (Kim Jong-Il's birthday). "My father says that Korea is the most beautiful country..." says eight-year-old Zin-mi. And so it might seem as Mansky films her in joyous, patriotic school pageants and in dance class, or with her parents, eating delicious food in their picturesque apartment. Filmed over three years on what will soon be the world's largest railway network, traces the vast interiors of China on the move. Four documentaries spanning two decades are included in this 5-disc box set, with a 16-page booklet and bonus film about the late filmmaker. A portait of life in the USSR in the '50s and '60s, this is the new film by Sergei Loznitsa (Blockade). Shohei Imamura's investigation into the disappearance becomes an investigation into the nature of fiction and reality.